There’s something about making one’s own pizza that makes one feel ever so accomplished! Or maybe it’s just me, I’m a little weird that way. No, I really think it’s everyone. I’ve never seen anyone, young or old, not extremely pleased with themselves after creating their own pizza, even if it’s at one of those restaurants where you make it at the table and they bake it for you. My girls love going to Flatbread Pizzeria here in Bend and making their own little cheese pizzas. I’ve never seen them eat pizza so well! Ella even had mushrooms on hers the last time we went there. 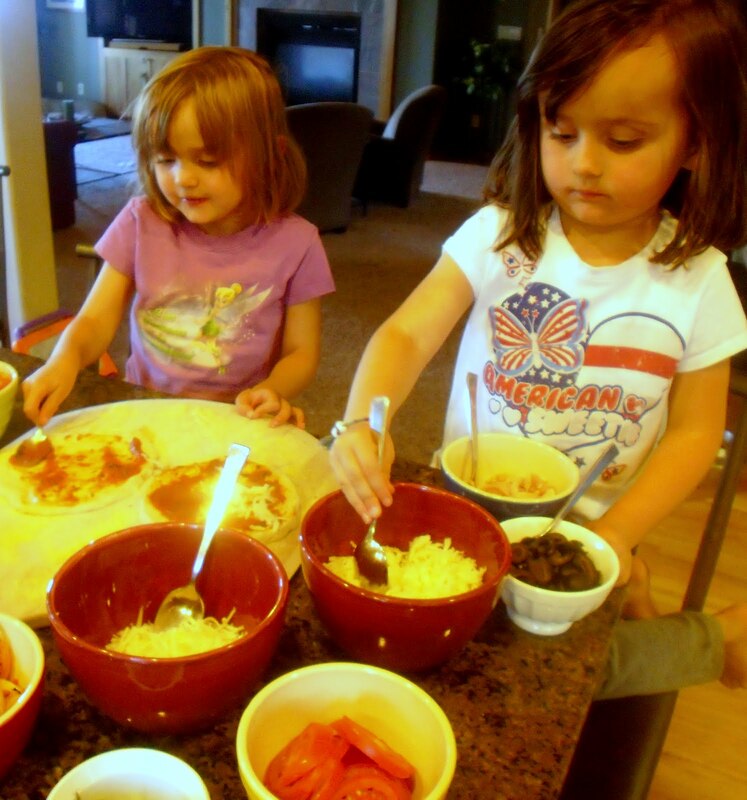 Proof that, when kids are involved with preparing their food, they are much more likely to eat it. Anyway, I have resolved to let them have that experience right here at home on a more regular basis. 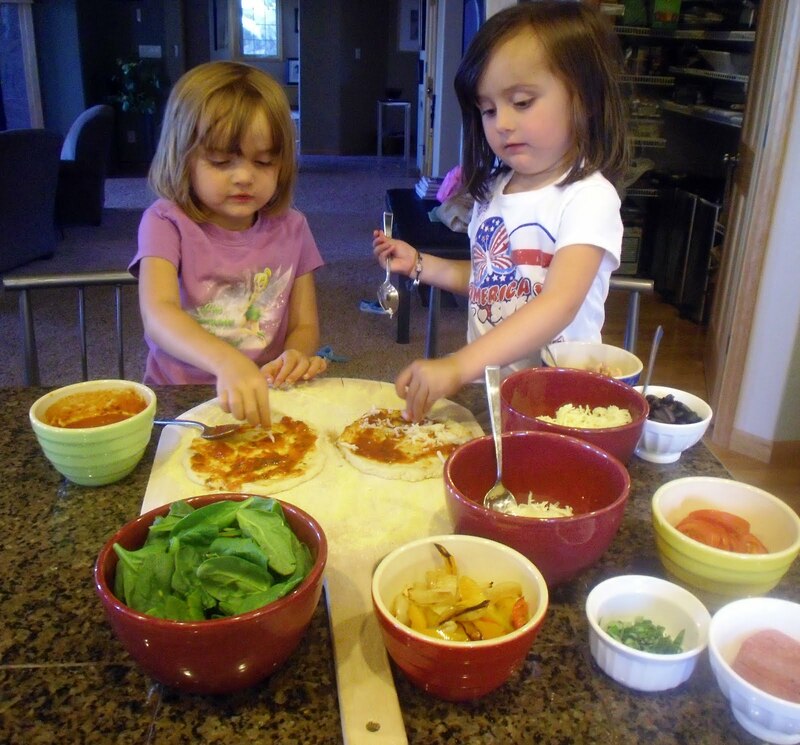 It’s far more economical, even if you purchase already made dough and sauce, and kids will generally try more toppings if they are all right in front of them. I get a little hyper when I’m making pizza because I am so totally invested in making it the best pizza I’ve made yet. Did I knead the dough enough? Will it be crispy and chewy and perfect? Did I get enough cornmeal on the stone this time or am I going to have a heartbreaking mess in my oven causing me to swear like a sailor (or a chef, they swear at least as much as sailors)? Is my flimsy pizza peel with the large crack going to hold up one more time? What about the sauce? Did I put enough oregano in the sauce? These are the questions upon which my entire evening’s mood rest upon. Bob’s learned, surprisingly, very little over the last 23 years, but he has learned to placate me when it comes to my adventures in the kitchen. It’s in everyone’s best interest. He always assures me that it is the best crust yet, better even than last time, not that that wasn’t good! I know… high maintenance. There’s no reason for you to put yourself (or your partner) through that kind of drama unless, of course, you enjoy it like I do. You can purchase a perfectly good crust and pizza sauce at the market or even at your local pizzeria. Then all you have to worry about are the toppings, which are easy. 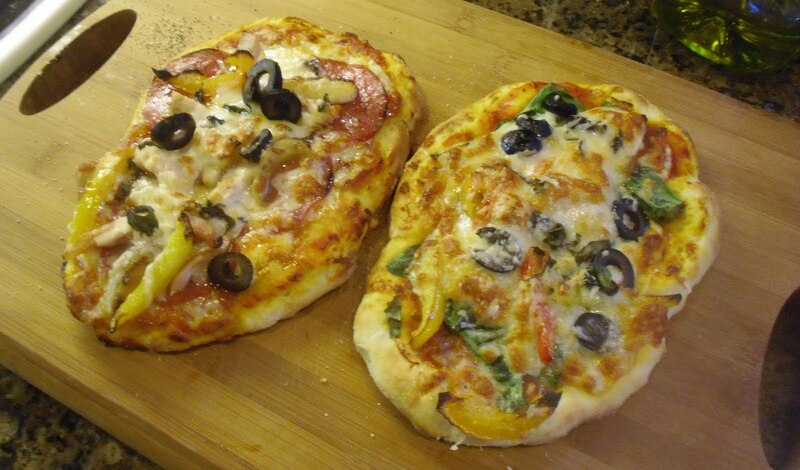 Before prepping your pizzas, preheat oven to 475 degrees F. If you are using a pizza stone, place it in the cold oven then allow it to preheat for @ 30 minutes, or longer, so it’s good and hot. If you are using a baking sheet, preheat the sheet for 10-15 minutes before placing the pizza on it. Lightly flour the pizza dough and roll out to the shape and size you want. 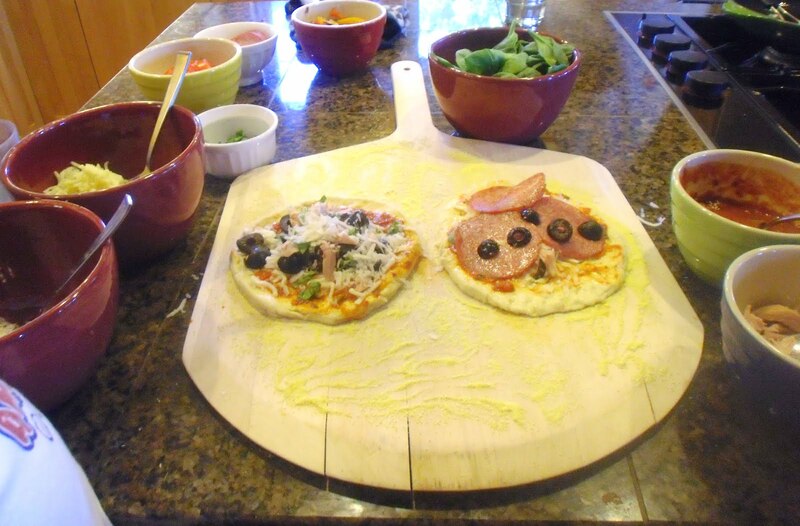 Generously sprinkle pizza peel/paddle (a cutting board would work too) with cornmeal and place shaped dough on it. I’ve learned, the hard way, that the crust will stick to the stone if you don’t use enough cornmeal so don’t be bashful about it. It’s not going to really affect the texture or flavor of the pizza because most of it will fall right off after it’s cooked. 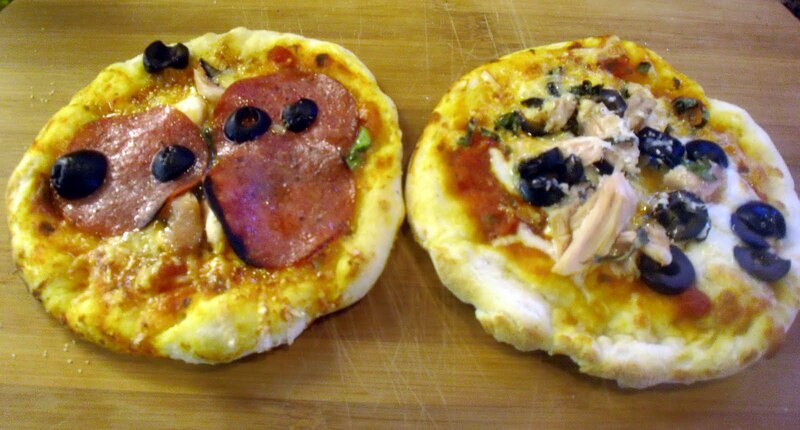 Rub a little olive oil over the dough before you start with the toppings. 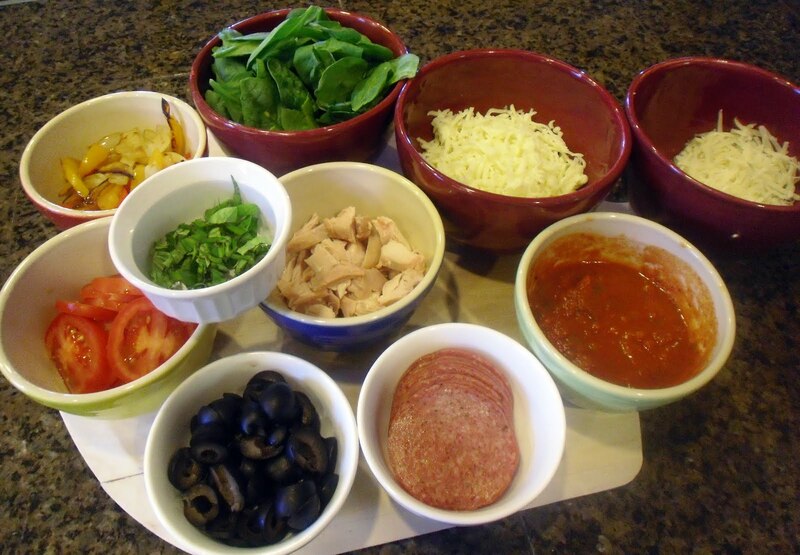 Carefully, transfer pizza directly onto the preheated stone or pan and allow to bake until crust is brown and cheese is bubbly – about 8-10 minutes. So good! And, yes, we were all very proud. And, not out 20 bucks for greasy delivered pizza (although let’s face it, sometimes there’s no substitute for that).